Bacterial blooms are extremely common, especially in newly set up saltwater aquariums, or in those where overstocking or overfeeding has occurred. Heterotrophic bacteria feed on organic matter, such as decaying algae, fish feces, dead fish and dead bacteria. These bacteria can rapidly reproduce, so if there's too much organic debris in your tank, this may lead to a bacterial bloom. 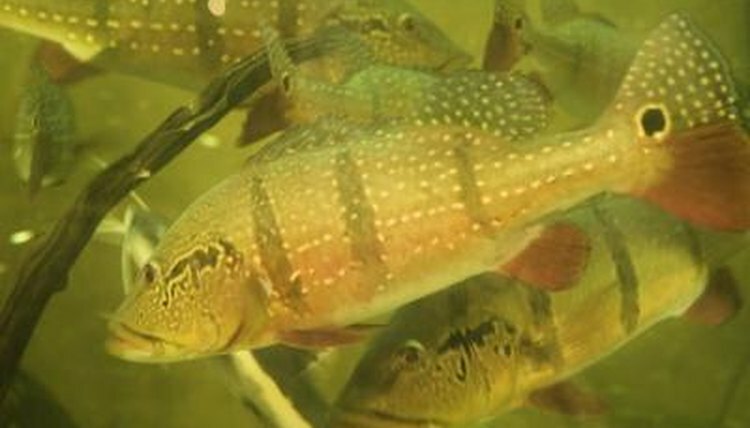 An aquarium suffering from a bacterial bloom will have a light brown or white haze to the water. Although these blooms sometimes go away on their own, it's best to take action to prevent them getting worse. Remove the filter from your tank and run it under cold water to remove any dirt and debris caught inside before replacing it. Check that your filter is powerful enough for the size of your tank and the amount of fish you're keeping. Ask your nearest aquarium supply store if you're unsure. Change 25 to 30 percent of the water in your tank. Replace the water with tap water that's been treated with a commercial aquarium water conditioner and had the correct amount of aquarium salt added to it. The amount of salt you use will vary according to the volume of water you're replacing and the type of salt you're using, so check the package for details. Continue replacing 25 percent of the water every two to three days until the bloom has gone. Clean the gravel in your tank using an aquarium gravel vacuum. Make sure you're siphoning off all fish feces and leftover fish food. If you notice an excess amount of both of these, you may be overfeeding your fish. Reduce the amount of food you're giving them to help prevent a further bacterial bloom.  You can choose to treat the water with a specialist enzyme mixture. While this will clear up the bacterial bloom right away, it won't solve any underlying issues, so the bloom may return.  The bacterial bloom should go away within a week. If your water remains cloudy after this time, it might not be a bacterial bloom and you may need to consult an expert.  Prevent future bacterial blooms by doing routine weekly 20 percent water changes, vacuuming your gravel and cleaning your filter.